This young boy not only lost his leg through an exploding mine, but all hopes of living a normal life. He will depend on the mercy of his fellow men for the rest of his life. From a distance it looks peaceful and fascinating. Seen from up close it shows its flip side. Since the dawn of time, wars have been erupting, bringing agony and misery to the innocent. Nowadays modern wars leave a devilish legacy behind - millions of anti-personnel and anti-tank mines as well as other explosive remnants of war. 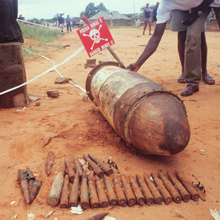 These explosive ordnance threaten the lives of people and animals in almost 60 countries on this planet. Wars have transformed thousands of square kilometres into death zones that nobody dares to enter. The relics of these wars, often long gone, and armed conflicts do kill, maim and mutilate the innocent on a daily basis. These mines and other remnants of war do hinder development, and do stop civilians from utilising valuable resources such as farm and grazing land, roads and water sources. Mines do not differentiate between the soldier and the civilian, the elderly, men, women, children or animals. Unlike other weapons of war, thought up by mankind, they are inadvertently triggered by the victims themselves. The following figures are officially documented. The estimated number of unreported cases is probably much higher. In 2013, 3308 people became victims of landmines or other exploded remains of war. Most of the persons concerned came from Afganistan, Columbia and Pakistan. 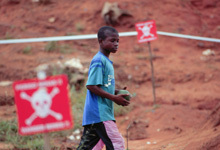 The major sponsors for demining programs are the United States, Japan, Norway, the EU, and the Netherlands. These five donors are responsible for 65% of all funding. Largest stocks of antipersonnel mines are found in Russia (with 26.5 million antipersonnel mines), Pakistan (estimated 6 million), India (estimated 4–5 million), China (“less than” 5 million) and the US (3 million). The Monitor (www.the-monitor.org) identifies 11 states as potential producers of antipersonnel mines: China, Cuba, India, Iran, Myanmar, North Korea, Pakistan, Russia, Singapore, South Korea, and Vietnam. Most of these countries are not actively producing mines but reserve the right to do so. Active production may be ongoing in as few as four countries: India, Myanmar, Pakistan, and South Korea. US stopped production of anti personnel mines in June 2014. Overview "The global mine problem"